The goal of this project is to allow anyone to send and receive postcards from all over the world! The idea is simple: for each postcard you send, you will receive one back from a random postcrosser from somewhere in the world. Simply because, like its founder, there are lots of people who like to receive real mail. Receiving postcards from different places in the world (many of which you probably have never heard of!) can turn your mailbox into a box of surprises — and who wouldn't like that? The first step is to request to send a postcard — we'll give you the address of a random member and a Postcard ID (e.g. : JP-12345). Pick a postcard, write a friendly message, along with its Postcard ID and the address given. Don't forget the stamps! Now all you need to do is mail the postcard on your nearest postbox or post office. 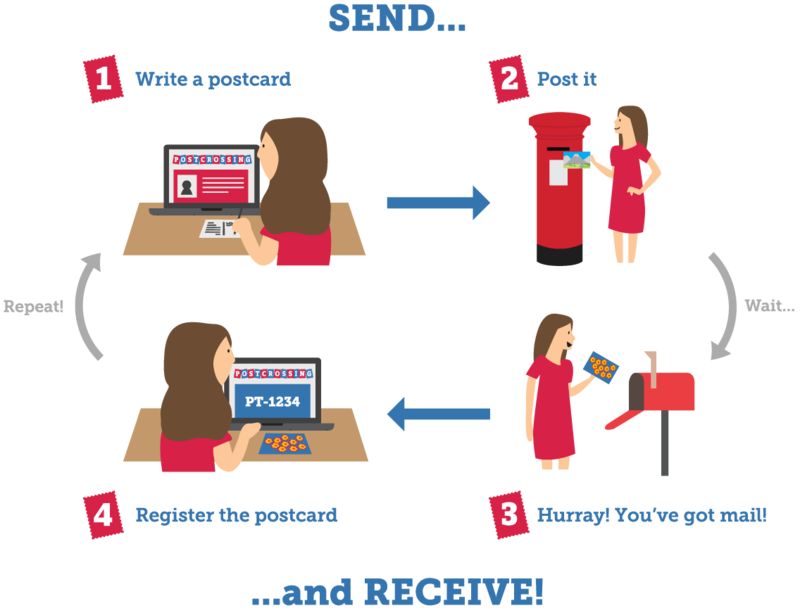 When your postcard arrives, its recipient will register it using its Postcard ID. This will make you eligible to receive a postcard from another member — and where your postcard will come from is a surprise! 3 Hurray! You've got mail! One day you'll check your mailbox and a postcard from someone far away will be waiting for you! Now it's your turn to register the postcard using its Postcard ID. That's it! Oh, and you don't need to wait to send more — you can have several postcards traveling at the same time. The more you send, the more you will receive! Want to learn more? Check our F.A.Q. !